Florence + the Machine (a stylisation of Florence and The Machine) is a London, UK, art pop band led by singer-songwriter Florence Welch and formed in 2007. The band consists of: Florence Welch (vocals), Robert Ackroyd (guitar), Isabella Summers (aka Isa Machine - keyboards), Tom Monger (harp), Mark Saunders (bass, percussion), Christopher Lloyd Hayden (drums, backing vocals), Rusty Bradshaw (keyboard, backing vocals) and Sam White (backing vocals). Lead singer, Florence Welch, was an art-college drop-out, from Camberwell (London), who was discovered singing Motown covers in a nightclub toilet, drunk. ”The Machine” name originated with an in-joke between Welch and Summers. 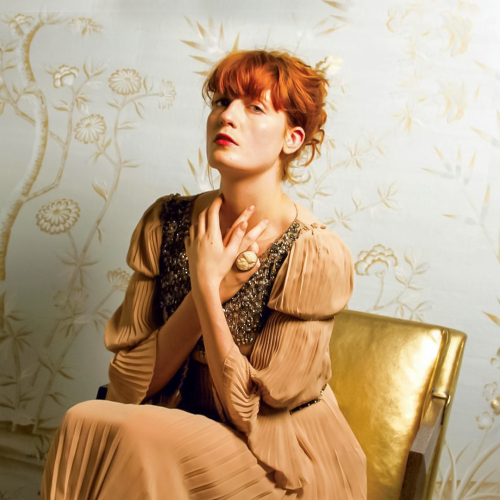 Musically, Florence + The Machine's sound is sometimes referred to as soul-inspired indie rock. Welch grew up listening to The White Stripes and Kate Bush and says she writes metaphorical songs that are "stories with consequences and weird morality issues." 2008 Florence + The Machine's music has received praise across the British music media, especially from the BBC, who played a large part in their rise to prominence, by bringing them into the spotlight as part of "BBC Introducing" (a program to support unsigned artists) - firstly at South By South West (SXSW) in Austin, Texas in March 2008 and later that year (Sept 2008) the band recorded a full session for the BBC at their Maida Vale studios. 2009 - 2010 - first awards and first studio album - "Lungs" At the Brit Awards 2009, Florence + The Machine received the Critics' Choice Award at the Brits in the UK. The award was introduced in 2008 (when it was awarded to Adele) and focuses on new and emerging British talent, voted for by a panel of music industry experts. The band's début album was "Lungs" (Jul 2009, Universal), preceded by third single Rabbit Heart (Raise It Up) (Jun 2009, Moshi Moshi). "Lungs" went on to become number one in the UK album charts in January 2010, and won the MasterCard British Album award at the 2010 Brits, where they performed a hugely popular collaboration, You've Got the Dirtee Love (live at The Brit Awards 2010) with Dizzee Rascal - a mix of You've Got the Love, the Candi Staton cover from "Dog Days Are Over" (Nov 2008, IAmSound), and Dizzee’s Dirtee Cash (Sept 2009, Dirtee Stank). 2011 - second studio album - "Ceremonials" The second album "Ceremonials" (31 Oct 2011, Island) - with which Welch was inspired for the title and some themes from a '70s Super 8 film of an art installation, she recalls: "... this big procession of kind of coquette-style hippies and all these different coloured robes and masks, and it was all to do with colour, really saturated, brightly coloured pastas and balloons. I saw it a couple years ago, and it was called 'Ceremonials' and then, like, Roman numerals after it. And the word sort of stuck with me, and I think the whole idea of performance ...". The album is also influenced by hymns, poems and church bells. 2012 - MTV Unplugged album - "MTV Unplugged" In 2012, the band released a live album - "MTV Unplugged" (Apr 2012, Universal) - as part of the MTV Unplugged series. It was filmed in December 2011 in New York’s oldest synagogue building, Angel Orensanz Center, with the band being backed by a ten-person choir. 2015 - third studio album - "How Big, How Blue, How Beautiful" The band's long awaited third studio album is called "How Big, How Blue, How Beautiful". It was released on May 29, 2015 on Island Records. 2018 - fourth studio album - "High As Hope" The band's fourth studio album is called "High As Hope". It was released on June 29, 2018 on Republic Records.